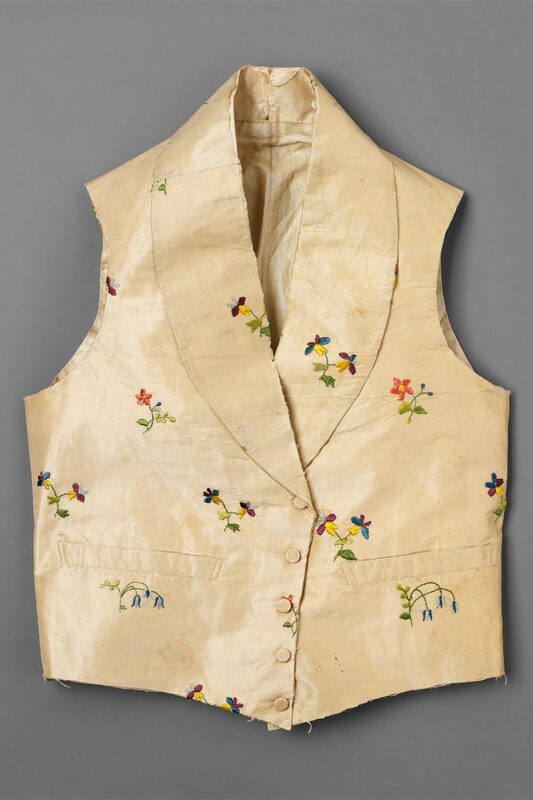 White, cream and other pale-coloured waistcoats were popular choices for mid 19th Century bridegrooms who could afford to buy new clothes for their wedding ceremonies, and were frequently kept by their descendants for sentimental reasons, as in this case. 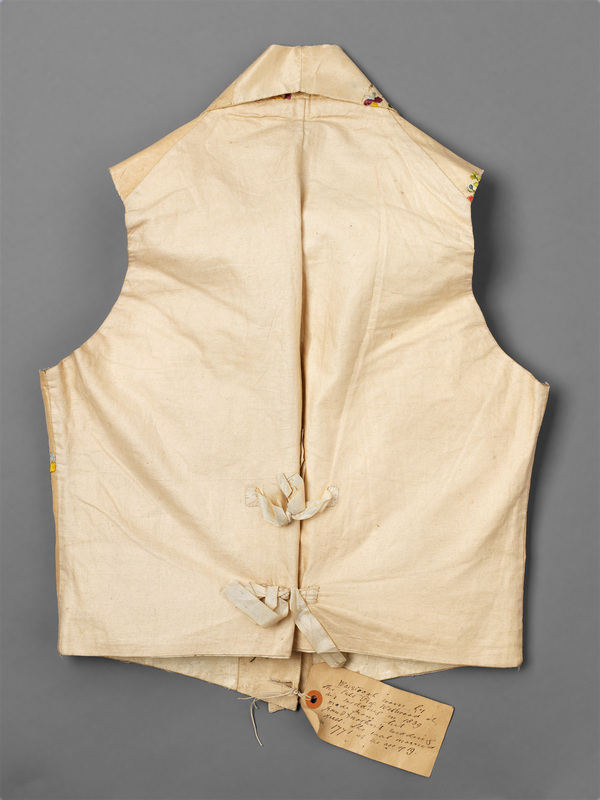 Tied through its bottom buttonhole, a paper label has been inscribed with the information ‘Waistcoat worn by the late Prof. Westwood at his wedding in 1839, made from his grandmother’s wedding dress. She was married in 1771 at the age of 19’ (see ‘Additional image’). The wearer’s pre-eminence in academic circles may well have been an additional factor in the preservation of the waistcoat. Professor John Obadiah Westwood was an entomologist and palaeographer who, in 1861, became the first Hope Professor of Invertebrate Zoology at Oxford University. In late 1839 he married Eliza Richardson at St George’s, Hanover Square, London. She accompanied him on his archaeological tours, working alongside him and sketching his finds. A lithographic portrait of Westwood in the National Portrait Gallery shows him, in his forties, dressed in a dapper fashion. On the reverse of the paper label the same hand has written ‘Lent by Mrs Edgar Dyke Whitmarsh, Oxford’. Mrs Dyke Whitmarsh was Professor Westwood’s niece, and wife to the vicar of Sandford-on-Thames, just south of Oxford. It is interesting to speculate on the circumstances of the loan of the waistcoat. Many 18th Century garments, particularly dresses, were re-used in the middle years of the following century. It is likely that Westwood’s grandmother had died a decade or so earlier, and that her grandson’s waistcoat was made from her wedding dress as a tribute to her. 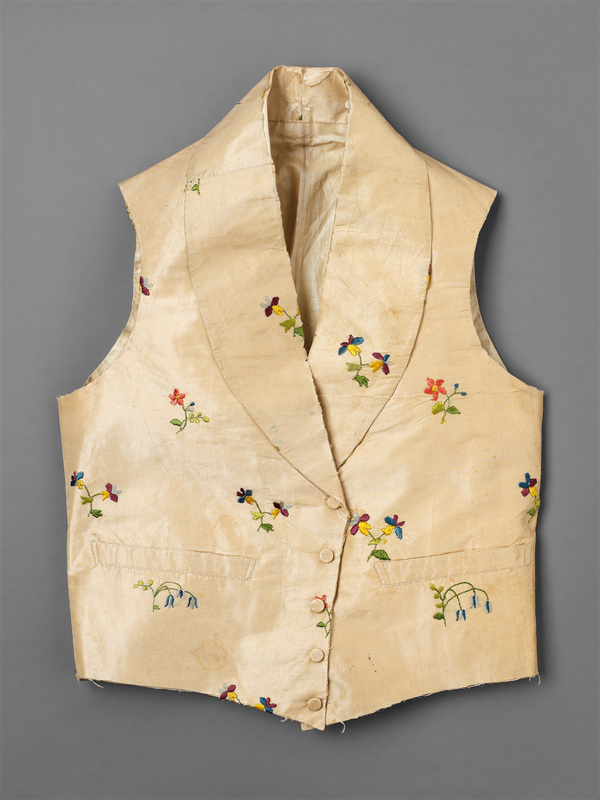 A reasonably pleasing symmetrical placing of the embroidery motifs on the waistcoat has been achieved; however, some of the flowers are cut off at the armhole and appear on the underside of the centre front, giving away the fact that it was not worked to shape, as would have been usual in the making of embroidered waistcoats at this date.